Manchester United are fairly confident of signing Jadon Sancho this summer. The youngster is currently lighting the Bundesliga up with his performances for Borussia Dortmund, which have unsurprisingly attracted interest from all across Europe. Paris Saint-Germain are said to be keeping an eye on the forward, but Manchester United are the club who seem most eager to swoop in for the starlet. While Dortmund continue to insist that the 18-year-old is not for sale, the Evening Standard indicates that the German giants could be convinced by an offer in the region of £80m. Apart from their enormous financial muscle, another factor that makes the Red Devils so confident in their pursuit of Sancho is the absence of an anti-United clause in the player’s Dortmund deal. 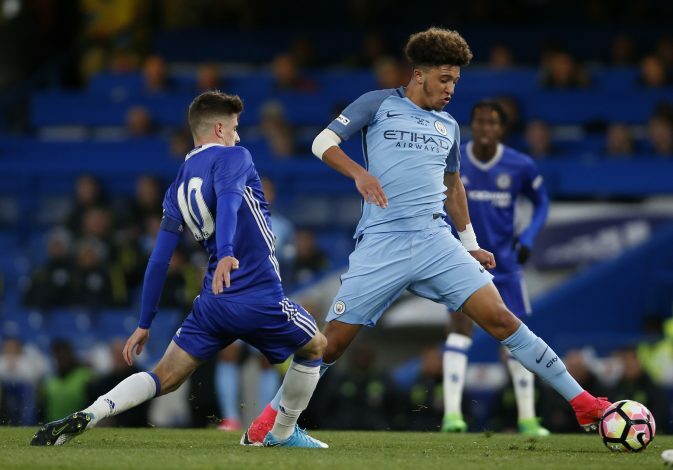 Sancho’s former club, Manchester City, had included such a clause during the sale of Brahim Diaz to Real Madrid. As per that condition, the Cityzens are entitled to a 15% fee from Diaz’s future sale – but that figure will rise up to 40% if the youngster joins a ‘Manchester-based’ club. However, no such clause was included in Sancho’s contract during his £9.1m switch to Germany, and Manchester United look set to take full advantage of this fact by going completely in for the Englishman. The report adds that although not announced as the permanent boss just yet, Ole Gunnar Solskjaer believes Sancho to be the perfect target for his side, despite the forward’s tender age and lack of experience in the Premier League. Will a sensational transfer materialise come summer?